I seem to have gotten the urge for more POWER... so I just changed up to Medium (D'Addario EJ17s) strings. Hey, the sound is GREAT [ ]. I guess I'm taking advantage of my new thick calluses. Although I'm still a rank beginner the improved sound makes me feel good (and the heavier strings give my fingers a better workout). Maybe we should make a follow on from ArnieÃ¢â‚¬â„¢s Ã¢â‚¬Å“Pumping IronÃ¢â‚¬Â� movie with PUMPING STEEL! WHICH STRINGS IS THE GUITAR DESIGNED FOR? I checked with Customer Care who reckoned lights (e.g. D'Addario EJ16s) but mediums shouldn't be any problem (maybe a small truss rod adjustment if required). I found the double winding at the end of the 6th (bass E 0.056) string made it just too wide to slide inside the bridge pin (it jammed stuck there) so I had to file the slot in the pin a little bit wider, to let the string ride up, so that the ball came into contact with the underside of the bridge (instead of just dangling inside the guitar body). This was my second string change with the Pro-Winder which is great for quick winding and string snipping (without needing to get pliers or a snip out of the toolbox)... BUT, first time round I used the Bridge Pin puller like a lever and made small marks on the bridge with it. (The marks are probably so small no one but I would notice them, but gee I was sad [ ].) This time I still levered the pins out, but sat the tool on a pick to protect the bridge. IÃ¢â‚¬â„¢m glad I did it and IÃ¢â‚¬â„¢m pleased with the result. The action is still very low (hardly any change at all [I checked, before and after, with the steel ruler]). Very pleased to be of help Shiner [ ]. What the heck does GAS mean (on this forum) please? Tie a string around a difficult pin and a gentle jerk upwards brings it out with no damage to the pin or bridge. Guitar Acquisition Syndrome. Got a bad case of it right now. That IS a GAS! Suddenly I understand so much more of the various things I've read on the forum. This is a very minor thing but whenever possible pins should be pulled straight up. Levering causes the pins to be stressed in a bending way and can cause the pins to break and/or the hole to be altered over time. Imagine pulling a nail out with a claw hammer. The nail always bends. I use wire snippers and a shim to remove my pins. I lay the tapered shim on the bridge and then put the snippers right under the shoulder of the pin. DON'T SQUEEZE the pin, just put enough pressure around the pin and then apply upward pressure. I move the shim increasing the thickness of the shim between the snippers and the bridge. I do this until it's loose enough to pull out with my fingers. The key is applying upward force to avoid what Dreadman noted about a nail and claw hammer. 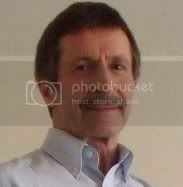 Here's a picture. Normally I would be using two hands (one for the snipper and the other for the shim), but I had to hold the camera. Sorry for the lack of light, but photo was taken at 6:00AM. 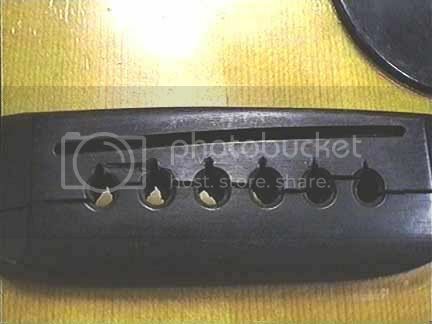 The shim serves two purposes 1) it allows you to apply better upward force and 2) it protects your bridge. The snippers do not harm the pins and I find they work better than the tool that usually is part of the winder. Here's one more little thing. If your pins are at all difficult to pull out you're probably pushing them in too hard. When changing strings they should be just a little more than placed in. Does that have anything to do with sound or is it more to avoid messing up the bridge? Exactly Dreadman. We've all seen the bridges that are cracked along the pin line. 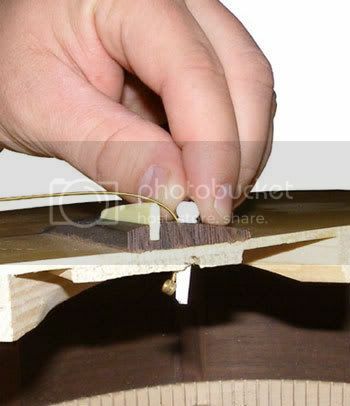 If one removes the string from the tuner, and pushes the ball end back into the hole, the pin should come out easily, if not it is pushed in too tightly to begin with. As for me, I still prefer the string trick on a stuck pin. I wouldn't take any kind of tool to any of my ebony or bone pins if one happened to get stuck. I wouldn't take any kind of tool to any of my ebony or bone pins if one happened to get stuck. Nothing to do with sound. The bridge pins job is only to hold the ball end away from the hole in the top and that doesn't require any down pressure on the pin at all. The string pressure only pushes the pin sideways. One more thought - if the pins are pushed in tightly and the ambient humidity drops the bridge could crack. Wood shrinks as it dries and if there's something preventing it from doing so evenly (like a tight pin) something will have to give. One thing I like is everyone's take on how they do things. Apart from adding to one's own knowledge bank, if it's something you do then you have a choice of different options or of picking an option you like better than what you're doing currently. My kids high school has a playoff game tonight, but when I get home, I am checking all of my pins (18 of em). Your comments and photos have me concerned now. Heard all about the string winding pin puller string snipping tools and I bought a couple of them. They work great. I was having a little trouble with one of the bridge pins and when I looked away and it came out I had also run a light groove into the spruce top as the tool got away from me. It is my mark and it is on my guitar and I do not mind it. But, be careful out there.